Cedar plank salmon makes a great addition to a meal. It is a tasty, healthy fish, rich in fatty acids and other nutrients. It also provides a whole bunch of protein, with little of the cholesterol that you’d find in beef or pork. It can be a little bland, though, and if eaten on a regular basis it gets repetitive and boring. There are, however, some ways to improve the flavor of salmon and keep it interesting. One of the best ways is roasting or baking on a cedar plank in the oven. Why Use a Cedar Plank? Cooking this way, using wood to flavor meat or vegetables, is something that is part of the cuisine of any number of cultures. It is a simple, healthy way to add a little more flavor. Putting the salmon directly on the plank allows natural oils and moisture from the plank to infuse the meat. The flavor that results is often described as smoky and savory. Cedar plank cooking is usually associated with cooking over coals in your backyard, but it works just as well and ends up just as tasty when done in your oven. Cooked this way, it is easier to control, safer and often has more consistent results. 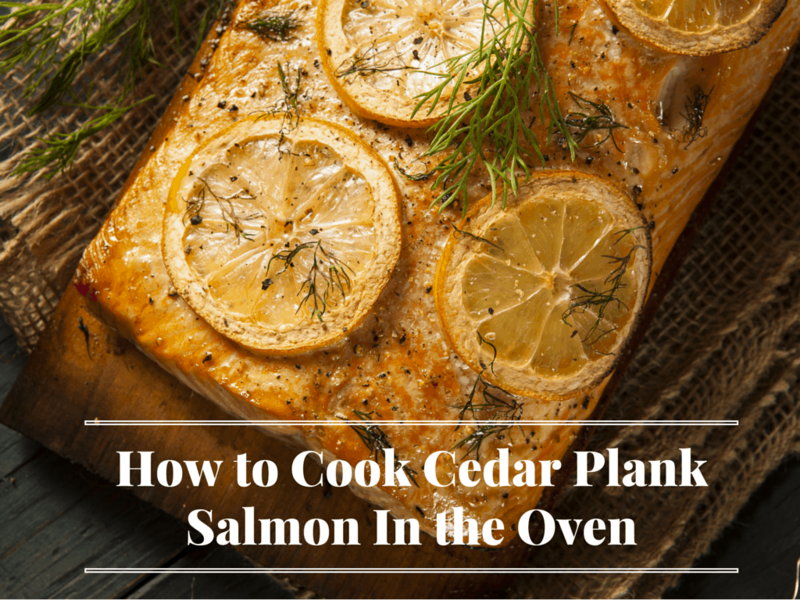 Baking salmon on a cedar plank is pretty straightforward. When done in an oven, it is much simpler and easier to manage than when done over an unpredictable and fiddly grill. There are a few simple steps to ensure that your salmon ends up tasty and healthy. Selecting your plank is an important part of the process. Never use treated wood. This sort of wood has any number of chemicals that waterproof it and keep it from deteriorating. However, these are extremely dangerous to ingest, and can lead to serious health problems. There are planks that are sold specifically for cooking. Most hardware and home goods stores carry them, and they are usually relatively inexpensive. It is a good idea to invest in one rather than trying to source your own. The plank should be soaked in cold water before being used. Opinions differ on how long it should be soaked. A good minimum for using it in an oven is two hours though soaking as long as twelve hours can also be done. You can also soak the plank before hand and freeze it for later use as well. The salmon can be prepared some ways. You can throw together a few simple ingredients to make a glaze or rub and add to flavor the fish. Salmon usually goes with glazes that are a bit salty and sweet. Using soy sauce as a base and adding maple syrup or brown sugar can make for a delicious meal. Dill is a traditional combination with salmon, as is mustard. However, a little olive oil, salt, and pepper is often enough to complement the flavor of the salmon. The fish usually is tasty enough on its own, and the addition of the cedar plank adds enough flavor that it can be great without a lot of additions. The oven should be preheated to 350 degrees. Spread a little olive oil on the plank, and place the fish on it skin side down. It can cook this way the whole time. There is no need to turn or flip it. The salmon should cook for at least 20 minutes until the flesh flakes easily. It is important that the fish cook thoroughly. There are a few ways to elaborate on this basic recipe to keep things interesting. Soaking the plank in wine instead of water can add another layer of flavor to the salmon. Sake or cider is also good to use for soaking. Sweet wines and liquors usually work well for this purpose, though experimenting a little can lead to some new ideas. It is possible to soak the plank for a little less time. This can result in a smokier flavor. However, this is a technique that can be difficult to manage in an oven. The danger is that the plank will grow hot enough to catch fire, ruining your salmon, among other things. Keep a sharp eye on your meal attempt this. This is a simple, tasty way to prepare a healthy meal. The plank cooked salmon pairs well with just about anything. With a little forethought, it can be a simple, healthy, and quick dinner, impressing guests or adding some variety at mealtime.